Luxury Flowers from flowers Aberdeen is a great way to really make a loved one feel special. Our Luxury Flowers collection are our finest bouquets and arrangements, all arranged to a very high standard, near perfection every time. Luxury flowers will always add class and sophistication to wherever they are placed and your recipient is sure to be delighted with them. At Florists Aberdeen we pride ourselves in our great Luxury Collection of bouquets and arrangements. All of our bouquets and arrangements are made of very high quality flowers, this doesn't just apply to our luxury flowers, but also our regular arrangements too, all of our floral bouquets consist of high quality flowers. In order to ensure that all our flowers for our Flower Delivery Aberdeen bouquets are of the highest quality we source all our flowers from the beautiful country of Holland. Holland is a gorgeous country and is made so by the beautiful flowers that grow there. We at Flowers Aberdeen only ever use flowers from Holland in our bouquets and arrangements. What's more as well as making sure that all our flowers are as beautiful as possible, we also make sure that our flowers are as fresh as possible. In order to do this we have all our flowers sent directly to our Florists Aberdeen shop, to ensure that they are as fresh and recently cut as possible, what's more we receive the flowers several times a week so that we always have a supply of fresh, beautiful flowers in our Flower Delivery Aberdeen shop just for you. We work hard to make sure that your are never disappointed by the services we provide here at Flowers Aberdeen. Here at Florists Aberdeen we have over 40 years of experience in the flower business. We know all there is to know about running the best florist possible. We know how to find the best flowers and arrange the, in the best possible way. And we know how to provide the best flower delivery service. As well as providing top quality flowers for our customers, we also provide a top quality delivery service. We know how busy and hectic life can be and that's why we have our Flower Delivery Aberdeen delivery service in place. For when you want to send beautiful, high quality flowers to loved ones but cannot find the time to do so. Our Flowers Aberdeen delivery service is second to none, and this is because we do much better than just send flowers a day or two after they are ordered, we offer same day delivery on almost all our bouquets and arrangements! Our same day delivery service is great for when there is a last minute occasions which may have slipped your mind, or for when you spontaneously want to surprise someone with beautiful flowers. 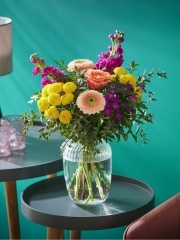 Simply make your order with Florists Aberdeen before 3pm, to give our florists time to arrange your bouquet to our usual high standards and we will have your bouquet ion its way to your recipient in no time. Our same day delivery service makes sending flowers out to your loved ones so quick and easy to do! 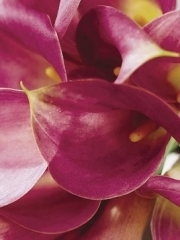 Here at Flower Delivery Aberdeen we are a part of Interflora, the international, network of florists. This means that when your order flowers with Flowers Aberdeen you can have them sent to any of 140 countries all over the world. 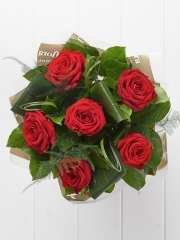 It is sop easy to treat your loved ones with Florists Aberdeen, no matter how far away they live.